Join us for the Ribbon Cutting Ceremony & Grand Opening Celebration! 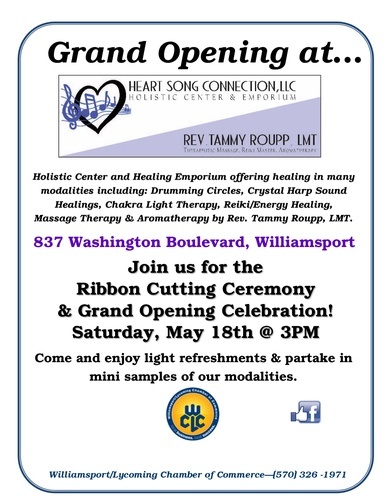 Holistic Center and Healing Emporium offering healing in many modalities including: Drumming Circles, Crystal Harp Sound Healings, Chakra Light Therapy, Reiki/Energy Healing, Massage Therapy & Aromatherapy by Rev. Tammy Roupp, LMT.